Published: July 9, 2012 at 11:44 a.m. Updated: Aug. 17, 2012 at 01:26 p.m. Round 1, Pick No. 5 - Tom Brady, QB, Patriots: I'm assuming that Arian Foster, Aaron Rodgers, Ray Rice and LeSean McCoy will be off the board, so I'm going with Brady (yes, a quarterback in Round 1). With a virtual cornucopia of weapons in the pass attack, including veteran wideout Brandon Lloyd, there's no reason to believe Brady won't have another monster season in the stat sheets. I won't have to take another quarterback until later in this draft. Round 2, Pick No. 16 - Darren McFadden, RB, Raiders: I know, there are main injury concerns with McFadden. But at this point in the draft I think he's worth the risk. If you project the numbers he posted in seven games in 2011 over a full year, he would have finished as one of the six best runners in fantasy football. I'll be sure to target Mike Goodson later, but I think the risk is well worth the potential reward based on McFadden's overall potential. Round 3, Pick No. 25 - Julio Jones, WR, Falcons: I've seen mock drafts where Jones has come off the board in Round 3, and others where he's still on the board in Round 5. Since this is my best-case scenario, I'll side with him going earlier. 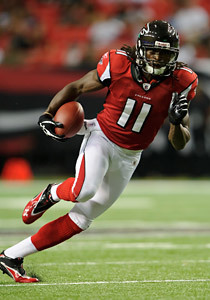 The Alabama product could push his teammate, fantasy star Roddy White, for production and value in 2012. I can see Jones finishing in the top five in fantasy points at his position, barring any injuries. Round 4, Pick No. 36 - Ryan Mathews, RB, Chargers: Mathews is out a few weeks with a broken clavicle, so I wouldn't be surprised to see him fall in some drafts. But at this point, there is no chance I would let a player of his talent pass even with the risk that's involved. Barring any setbacks, I will be getting a No. 1 fantasy running back at the price of a No. 2. Sign me up for that scenario all day long. Round 5, Pick No. 45 - Demaryius Thomas, WR, Broncos: In this draft, my strategy is to load up on running backs and wide receivers because I'm set at quarterback with Brady. Thomas, who I'm projecting to be a top-10 player at his position this year, would fill in as my flex starter and possible trade bait during the season. Will Thomas last until Round 6 in most drafts? It's possible, but I can see him coming off the board as soon as Round 4. Round 6, Pick No. 56 - Doug Martin, RB, Buccaneers: Martin is no lock to be the featured running back in Tampa Bay, but I like his chances to unseat LeGarrette Blount. The team wouldn't have used a first-round pick in April's draft if he wasn't going to see a prominent role, and Blount has proven to be a bit one-dimensional at the NFL level. Martin, a potential three-down runner, is well worth a shot here as a flex starter with upside. Round 7, Pick No. 65 - Jeremy Maclin, WR, Eagles: Maclin is coming off a disappointing 2011 campaign, so he's sliding in some fantasy drafts. I'd take advantage of that slide, because the Missouri product could be in line to have his best fantasy season ever. That makes him a potential steal here in the seventh round as a No. 3 fantasy wideout. Don't be shocked if he posted better than 1,000 yards and eight to 10 touchdowns in 2012. Round 8, Pick No. 76 - Jason Witten, TE, Cowboys: You might think Witten will be off the board at this point, but the spleen injury he suffered in the preseason is going to affect his overall draft appeal. With that said, I feel like I can land one of Witten, Jermichael Finley, Vernon Davis or Fred Davis at this stage of the draft. Again, this is a "perfect" scenario and I prefer Witten here. He'll be better in 2012 than in 2011. Round 9, Pick No. 85 - Robert Griffin III, QB, Redskins: I expect that some fantasy owners with thoughts of Cam Newton running in their heads will take Griffin in one of the first six rounds. However, I can also see the talented rookie lasting until this point in drafts because of the immense depth at the quarterback spot. I won't need RG3 much with Brady at the helm, but the Baylor product could turn into great trade leverage during the year. Round 10, Pick No. 96 - Denarius Moore, WR, Raiders: Moore showed flashes of potential as a rookie, posting 618 yards with five touchdowns in 13 games. Maybe more impressive is the solid 18.7 yards-per-catch average he recorded as one of Carson Palmer's favorite downfield threats. Some fantasy fans out there might prefer Darrius Heyward-Bey, but I think Moore is the Raiders wideout to target. His potential in that offense could be limitless. Round 11, Pick No. 105 - Stevan Ridley, RB, Patriots: Ridley is considered a high-end sleeper in some circles. I'm not so sure, as he could lose plenty of work to Shane Vereen and Danny Woodhead in New England's backfield rotation. But at this point in a draft, I'm looking for players with statistical upside. Ridley, despite some of my concerns, fits that description. The Ridley-Vereen battle is one to keep close tabs on in the summer months. Round 12, Pick No. 116 - Titus Young, WR, Lions: Notice a theme in the late rounds? As I mentioned earlier, it's all about targeting players with real statistical upside at this late stage of the draft. As a result, I'm targeting deep sleeper Young as a fantasy reserve and starter during the bye weeks. Though he did get into a fight with teammate Louis Delmas in the offseason, the Boise State product has drawn rave reviews on the field. Round 13, Pick No. 125 - Mike Goodson, RB, Raiders: I always like to draft five running backs and five wide receivers. The wideouts are all set, now I'm adding my last back. Because my No. 1 fantasy runner, McFadden, has been so prone to bumps and bruises, landing Goodson is a must. That is, assuming he beats out Taiwan Jones for the second spot on the Raiders depth chart. If Jones wins the job, he's obviously the runner I'll target instead. Round 14, Pick No. 136 - New York Giants defense: Now that I have all of my offensive skill positions filled, it's time to grab a defense. Honestly, I could go in a million different directions with this selection, but I'll take the Giants and see what happens. If this unit struggles to produce fantasy points in the first few weeks, I'll drop it an play the matchups for the rest of the season. Either way, I'll be fine at the position. Round 15, Pick No. 145 Stephen Gostkowski, K, Patriots: It's time for Mr. Irrelevant, at least in this case, and it's a kicker (no shock, right)? I figure that Gostkowski will still be on the board in the final round, but I would take Dan Bailey, Garrett Hartley, Matt Prater or whichever kicker is the best available at this position. Remember, there is never, ever a good enough reason to draft a kicker until the very last round.